"He ran out from under a leaky roof and found himself in the rain" -An Afghan proverb. Afghan refugees. Asylum seekers. Detainees. Who are the men and women, the mothers, fathers and children, behind the news headlines and the politics, where are they from, and what really happens to them here in Australia? 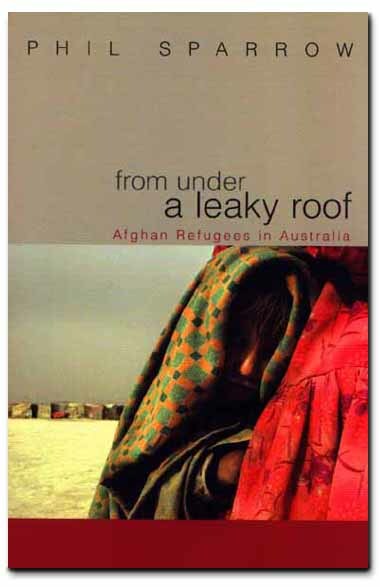 From Under A Leaky Roof traces the journey of many Afghan refugees currently living in Australia. Based on interviews with refugees and the people who work with them the book details common experiences of discrimination and persecution which led them to flee their homes, the despair of detention in Australia and the fear and uncertainty when they try to start their new lives in the Australian community. About the publication Phil Sparrow, From Under a Leaky Roof (2005): This book is now out of stock, and we no longer supply it to our members or to the wider public. We suggest you could search for online new or second-hand bookshops to secure your copy. Mr Phil Sparrow and wife Julie went to Afghanistan in 1999 to work for the International Assistance Mission, Phil as a project leader in community development and Julie as a trainer and facilitator, but things changed swiftly after the terror attacks on America on September 11, 2001. People fleeing from Afghanistan and the Middle East and seeking asylum in Australia in recent years have occupied much of the public's imagination in a quite disproportionate fashion, given the actual numbers and issues involved. Misleading and highly pejorative descriptive terms such as 'flood', 'tidal wave', 'swamping', 'queue jumpers', 'illegals' have dominated and agitated the discourse, which has been further inflamed by a succession of accidental and deliberate misconstructions of the actions and motives of asylum seekers. Statistics released in April 2002 report that there were 1,618 people detained in Australian detention centres. Of these, almost 400 had been detained for up to three months, 450 for three to nine months and the remainder, some 750 for more than nine months. Of these, 250 had been detained for more than 18 months. This number includes some 28 minors. In the ten months prior to April 2002, there had been nearly 12,000 people in detention centres (this number includes those arriving by routes other than by boat), including 1800 minors. Most of these had been released or returned. In the period 2000-02, Afghans made up 27 per cent of those seeking refuge. Iraqis and Iranians constituted the two other largest groups (33 per cent and 13 per cent respectively). Male asylum seekers outnumbered females by six to one. Later the Howard Government hurriedly developed (some would say 'developed' is too elevated a word) and implemented the 'Pacific Solution' policy of intercepting asylum seekers before they reached the Australian migration zones, and relocating them to hastily co-opted countries such as Nauru and Papua New Guinea. Detention centres were slapped together on these islands, the asylum seekers incarcerated and the UNHCR left to deal with the problem. Politically, this tactic permitted the Government to claim further success in dealing with Australia's refugee burden, and boast that with these new measures, no boat people at all were reaching Australia. Economically, the costs of this 'solution' have been enormous - in Nauru's case, the expenses paid by Australia practically saving them from bankruptcy. As refugees were removed from the public eye almost entirely, media scrutiny dropped off and public interest faded: reporting on 'un-people' from small islands in the middle of the Pacific is 'slow news', to use John Pilger's terms. This is just as well for the Government, as the human cost has been extraordinary, with detainees becoming even further isolated, living in unacceptable conditions, in some cases abandoned by the camp staff for weeks at a time. Detainees have become depressed and suicidal, and families have been split up. Aliabad is used as a metaphor here - Aliabad was a mental asylum near the University in Kabul, set in beautiful parkland, and it appeared a place of beauty and calm. The reality was that inside, it was a place of cruelty where people were mad. It was a prison where people died. Up until October 1999, all asylum seekers reaching Australia, once determined to be refugees, were granted permanent protection visas. Alarmed at the increase in numbers of those arriving by boat over the period 1998-99, the Government introduced the temporary protection visa (TPV). The substantial difference is that the TPV limits the holder to a three-year visa, which will be reviewed in the final six months. Those who are found to no longer be in need of protection will be returned to their countries of origin or to another country that will accept them. Those who are still in need of protection will be given either another TPV or in rare cases, a permanent visa. To gain a permanent visa, TPV holders need to meet criteria based on their travel to Australia and the date on which they first applied for protection. These criteria are strictly adhered to and only a small number of TPV holders meet them. The TPV significantly reduces the rights and entitlements of holders - access to welfare benefits and education, counselling and assistance are all more limited and the holder may not leave Australia without revoking his or her right to re-entry, nor may they sponsor their family to come to Australia. In effect, this visa is created to be as unattractive as possible, while meeting the minimum standards needed for Australia not to be in breach of international conventions on refugees and of humanitarian law. Not satisfied with the results this new visa class was achieving, in September 2001 the Government amended the Migration Act legislation to further limit the entitlements it conferred, specifically with regard to those holding TPVs. Under the new conditions, any asylum seeker arriving directly in Australian territory who lodges an application for a protection visa who had 'resided' more than seven days in a potential refuge country en route to Australia can never apply for or obtain a permanent visa, though the minister does have the discretion to waive this condition. This ruling cannot otherwise be appealed. The precedent to the TPV can be found in the Safe Haven visas granted to Kosovars who were evacuated to Australia during the Balkan conflict of 1998-99. The same approach was employed for East Timorese in 1999-2000. The Kosovar and East Timorese communities, while housed in military barracks, were still relatively free to interact in the community and a comprehensive range of services was provided. It is suggested by some writers that this interaction and the corresponding relationships, mutual cultural exchanges and broad public awareness that developed, are in part what fuelled the protests at the Kosovars' forced return in 1999-2000. In 1999, I worked closely with the Kosovars sent to Western Australia, providing counselling, and during this time observed how the Kosovars' proximity and the ease of contact with local people meant that they came to be seen as human, as real, as people like us. Empathy developed. There has been no corresponding opportunity for interaction and the development of broad-based empathy with asylum seekers in remote camps. This subsequent dearth of relationships, absence of cultural learning, exchange and understanding have left a public vulnerable to propaganda and cynical manipulation. This weakness has been effectively exploited many times. PHILIP RUDDOCK, then Minister for Immigration, Multicultural and Indigenous Affairs: ... this is a national emergency ... It is an assault on our borders ... So-called boat people are flying first class into Indonesia and Malaysia before boarding rickety vessels for Australia ... people who have the money, those who are prepared to break our law, those who are prepared to deal with people smugglers and criminals. PETER REITH, then Minister for Defence: [the asylum seekers] may well include underground members of the Al Qaeda terrorist network. [Unauthorised arrivals of boat people] can be a pipeline for terrorists to come in and use your country as a staging post for terrorist activities. DIMIA: There are also in immigration detention former terrorists, former senior officers and military personnel of despotic regimes, people who are suspected of crimes against humanity. JOHN HOWARD, Prime Minister: Quite frankly, I don't want in this country people who are prepared, if those reports are true, to throw their own children overboard. And that kind of emotional blackmail is very distressing ... I don't want those type of people here, I really don't. PETER REITH: It is an absolute fact, children were thrown in the water ... if you don't accept that, you don't accept anything. It would be untrue to suggest that it is only from the Government that such dangerous notions have come. But most of them have. And statements from the Government carry a weight that other comments may not; they are assumed to be true and subject to less immediate critique. Anyway, the final responsibility for leadership - and perhaps more importantly, integrity - in a public issue such as this is with the Government and they have been quick to raise the red flag, quick to wave it around, and slow to lower it. It should be clear that the emotional weight attached to the label 'terrorist' assumed far greater negative significance post-September 11, 2001. In its frequent co-option of this term, either the Government of Australia didn't realise this, or it did realise, and didn't care. More sinisterly, and perhaps more likely, it realised and intentionally used the term in conversations and statements about refugees and asylum seekers to further polarise attitudes and gain support for its position. These sentiments and these changes in language have won the support of the Australian public through rhetoric such as that quoted above and, in spite of little or no evidence to support the various claims, derision and accusations levelled at asylum seekers. There is no flood. There is no border assault. No children were thrown in the water, and there has only been one identified war criminal among all the asylum seekers to arrive in Australia in the last four years. It remains a moot point as to what constitutes a 'war criminal' when assessing people from a country such as Afghanistan, where conscription was the norm and almost all men over a certain age were involved in some kind of bloodshed, willingly or not. According to both the Australian Secret Intelligence Organisation (ASIO) and DIMIA checks, no terrorists have come to Australia via people smugglers. Those who have actually interacted with the refugees from Afghanistan, Iraq and other countries find them hardworking, honest, hospitable, thrifty, reliable and willing to work where Australian citizens are not, in conditions Australians dislike. Nonetheless, this distortion has occurred. The lamentable and shameful result is that Government policies have acquired strong public support, and correspondingly, there has been a massive impact on the rights, protection and treatment of refugees.